Most astronomers now agree that essentially all massive galaxies host supermassive black holes (SMBHs) at their centers, millions to billions of times as massive as the Sun. However, the question of where these black holes come from is still hotly contested. Do they arise when large gas clouds originally in the centers of forming galaxies gravitationally collapse, gathering their surrounding material in the process? Do they form from the earliest central star clusters, composed of massive stars that end their lives as smaller black holes which then coalesce into one huge black hole? For SMBHs to get truly giant, it seems they must accrete a lot of matter, but how big are they when they start out, and how does this accretion process proceed? (In bursts? Is it mostly steady? Are mergers between different black holes important?) As you can see, there is a host of open questions, many of which are being researched today. In the paper highlighted in today’s astrobite, the authors investigate what appears to be one of the least massive SMBHs we know of today, in an attempt to shed some light on what many SMBHs of today may have looked like in an earlier phase. 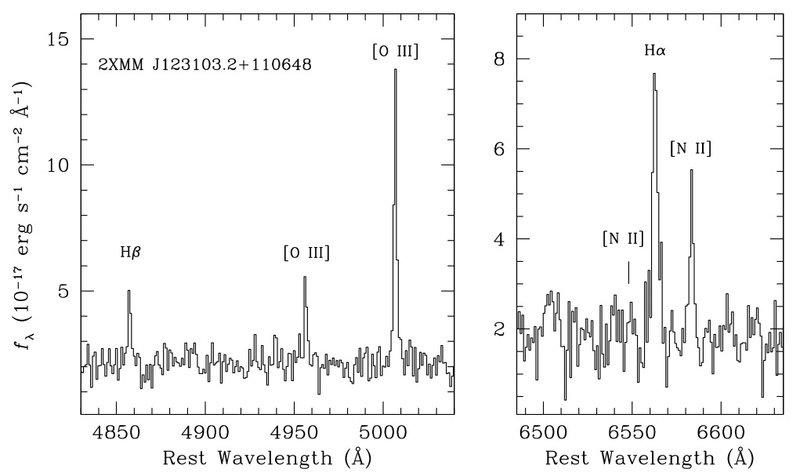 The optical spectrum of J1231+1106, showing several prominent emission lines typical of AGN. The object studied, called J1231+1106, appears to be an accreting black hole in the center of a distant galaxy. This means that it falls into the class of objects called active galactic nuclei (AGN) – central regions of galaxies that show emission over a large range of wavelengths that is thought to be produced by an accretion disk around a SMBH. J1231+1106 was selected in a previous study (Kamizasa et al. 2012) as a potentially low-mass black hole on the basis of its X-ray variability. Another study, by Terashima et al. (2012) confirmed that this object is very strange – its X-ray spectrum shows none of the absorption typical of many AGN, while the extreme variability suggests that it is accreting at a high rate. These results indicated that J1231+1106 could be as small as 10^5 solar masses – one of the least massive AGN ever identified. However, these results hinged on the fact that the object was of extragalactic origin – something that was hard to prove without optical spectra to provide an accurate distance estimate. To confirm this, the authors of today’s study used one of the two Magellan telescopes at Las Campanas Observatory, in Chile, to get a high signal-to-noise optical spectrum of the source (shown above). The punch line: the X-ray source is indeed extragalactic, and it is located in a small, faint galaxy approximately 1.8 billion light-years away. The X-ray vs optical luminosity of various AGN, with J1231+1106 shown in red. Despite appearing to be a type 2 AGN, this object has X-ray vs optical properties much more in line with type 1 objects. In addition to getting an accurate distance estimate, the optical spectra allowed the authors to investigate several other properties of this low-mass AGN. The relative strengths of various emission lines provide further evidence for accretion onto a black hole, because of the photon energies required to produce such ratios. At the same time, the lack of broad emission lines (where “broad” in AGN-speak implies that the emission lines come from gas moving at velocities greater than 1000 km/s) combined with the lack of X-ray absorption challenges the theory that different types of AGN can be explained as different projections of the same physical phenomenon. Known as the “unified model”, this theory posits that most accreting SMBHs have a close-in region where broad emission lines are produced, while narrow lines are produced further away. In the unified model, we expect that in some objects, due to the direction of our observations, the broad-line region will be hidden by some obscuring gas or dust, causing us to only see narrow emission lines. However, since J1231+1106 doesn’t appear to have any gas obscuring its X-ray emission, we would expect to see the broad-line region, and the fact that we do not means that it cannot be explained by the unified model. 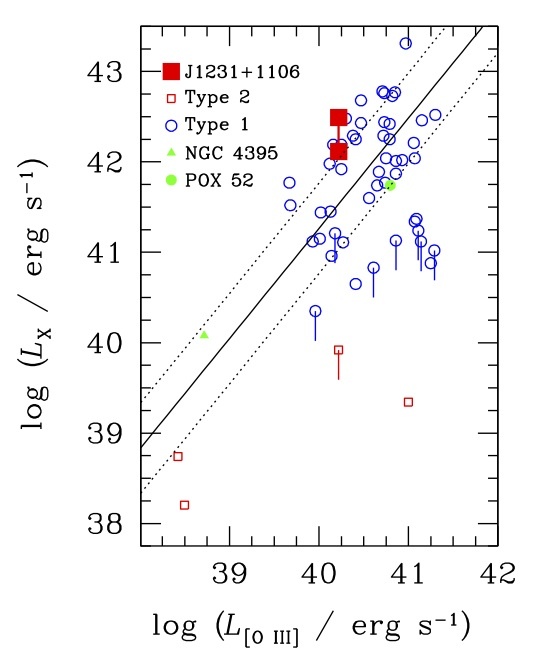 Another commonly examined feature of AGN is their X-ray to optical emission ratio, shown in the plot at left. Puzzlingly, while J1231+1106 should be a narrow-line AGN based on the spectrum discussed above (“type 2” in the figure), its X-ray to optical ratio fits in much better with other broad line objects (shown as “type 1” in the figure). While the authors don’t offer an explanation of this discrepancy, they do comment that this is further evidence that the X-rays are intrinsically unabsorbed, and therefore it is unlikely that a broad-line region in this object is merely obscured. Perhaps most importantly, the optical spectra allow the authors to place further constraints on the mass and accretion rate of J1231+1106. Using the width of the observed emission lines and some common dynamical assumptions, the authors conclude that the mass of this object is likely no more than 10^5 solar masses, placing it securely as one of the lowest-mass SMBHs ever measured. In addition, it appears to be accreting at a very high rate. These assessments, combined with the fact that this object is located in a low mass, probably spiral galaxy, indicate that perhaps J1231+1106 is indeed an example of a young, accreting black hole. Gathering more statistics through larger samples of such objects may give astronomers a better idea of how SMBHs grow, and thus answer some of the questions posed at the beginning of this post.